The man leans on the base of a structure with fluted columns. In a niche between the columns is a marble sculpture of a draped female figure, of which only the lower portion is visible. These clues may refer to the subject's profession, perhaps that of a sculptor or architect. Carved reliefs, barely discernible, adorn the sides of the architectural base. The one at the right perhaps illustrates a classical hero or a warrior in armor. His formal black attire and sword may also imply high military rank or membership in an order of knighthood. In the background at the lower left is the Venetian Basilica of San Marco, placed in an imaginary pastoral setting. The inclusion of the basilica likely alludes to the sitter's association with the church or the Venetian state. Possibly Count Lodovico Moscardo, Italian, (Verona, Italy), possibly by inheritance to his son, Moscardo Moscardi. Possibly Count Moscardo Moscardi (Verona, Italy), possibly by inheritance to his daughter, Teresa Moscardo, in 1785. Possibly Countess Teresa Moscardo, 1747 - (Verona, Italy), sold to Richard Vickris Pryor, 1802. Mrs. Douglas Graham (Wonastow Court, Monmouth, Wales), sold to C. Marshall Spink, Ltd., and D.A. Hoogendijk Gallery, 1939. Spink & Son, Ltd. (London, England) and D. A. Hoogendijk Gallery (Amsterdam, The Netherlands), sold to Herman Göring, 1940. Hermann Göring, 1893 - 1946 (Carinhall, Schorfheide, Brandenburg, Germany), returned to C. Marshall Spink, Ltd. and possibly D.A. Hoogendijk, about 1945. Source: Venema (1986) p. 269, 577. Alexander Wengraf (London, England), sold to Wildenstein & Co., 1956. Wildenstein & Co. (New York) (New York, New York), sold to J. Paul Getty, 1964. Raccolta di 60 stampe dalle più celebri pitture di Verona fatta de Gaetano Zacon (Verona: 1802), no. 32. Zacon, Gaetano. Opere Scielte de' più Celebri Pittori. (Verona: 1809). Caliari, Pietro. Paolo Veronese, sua Vita e sue Opere. (Rome: 1888), pp. 222-23, 338. Ingersoll-Smouse, Florence. Veronese: catalogue raisonné. (unpublished: 1920s? ), no. 545. Berenson, Bernard. Italian Pictures of the Renaissance: A List of the Principal Artists and Their Works with an Index of Places: Venetian School. 2 vols. (London: Phaidon Press, 1957), vol. 1, p. 138. Berenson, Bernard. Italian Pictures of the Renaissance: A List of the Principal Artists and Their Works with an Index of Places: Venetian School. 2 vols. (London: Phaidon Press, 1957), vol. 2, pl. 1042. Tietze-Conrat, Erica. "Paolo Veronese Armato (Ridolfi II, 225)." Arte Veneta, vols. 13-14 (1959 - 1960), pp. 97-98. Getty, J. Paul. The Joys of Collecting (New York: Hawthorn Books, Inc., 1965), pp. 31-32, 104, 108-9, ill.
Musgrave, Clifford. "Sutton Place, Guildford: The English Home of Mr. Paul Getty." The Connoisseur 161, no. 649 (March 1966), p. 149, ill.
January Calendar 1967, vol. 8. (Minneapolis Institute of Art. : January 1967), no. 5. Piovene, Guido, and Remigio Marini. L'Opera Completa del Veronese. (Milan: 1968), pp. 83, 88, no. 14. Béguin, Sylvie, and Remigio Marini. Tout l'oeuvre peint de Veronese. (Paris: 1970), pp. 83, 88, no. 14. Waterhouse, Ellis Kirkham. Notebooks. Vol. 58 (Los Angeles: Getty Research Institute), accession no. 870204, p. 221 (Dec. 10, 1970). Fredericksen, Burton B. Catalogue of the Paintings in the J. Paul Getty Museum (Malibu: J. Paul Getty Museum, 1972), pp. 37-38, no. 38. Cocke, Richard. "New Light on late Veronese." Burlington Magazine 116, no. 825 (January 1974), p. 24. Fredericksen, Burton B., ed. The J. Paul Getty Museum: Greek and Roman Antiquities, Western European Paintings, French Decorative Arts of the Eighteenth Century (Malibu: J. Paul Getty Museum, 1975), pp. 69, 90-91, ill.
Ticozzi, P. "Le incisioni di Paolo Veronese nel Museo Correr." Bollettino dei musei civici veneziani, vol. 20. (1975), pp. 46-47, no. 133. Fredericksen, Burton B., et al. Guidebook: The J. Paul Getty Museum. 3rd ed. (Malibu: J. Paul Getty Museum, 1976), pp. 63, 65, ill.
Guidebook: The J. Paul Getty Museum. Rev. ed. (Malibu: J. Paul Getty Museum, 1976), pp. 63, 65. Pignatti, Terisio. Veronese (Venice: Alfieri, 1976), vol. 1, pp. 25, 120 no. 103; vol. 2, fig. 341. Ticozzi, Paolo, ed. Paolo Veronese e i suoi incisori, exhibition catalogue. (Museum Correr, Venice: 1977), pp. 32-33, no. 91. Fredericksen, Burton B., Jiří Frel, and Gillian Wilson. Guidebook: The J. Paul Getty Museum. 4th ed. Sandra Morgan, ed. (Malibu: J. Paul Getty Museum, 1978), pp. 80-81, ill.
Cocke, Richard. Veronese (London: Jupiter, 1980), p. 47, no. 22, ill.
Fredericksen, Burton B. Masterpieces of Painting in the J. Paul Getty Museum (Malibu: J. Paul Getty Museum, 1980), unpaginated, no. 12, ill.
Fredericksen, Burton B., Jiří Frel, and Gillian Wilson. The J. Paul Getty Museum Guidebook. 5th ed. (Malibu: J. Paul Getty Museum, 1980), pp. 70-71, ill.
Cocke, Richard. Veronese's Drawings, A Catalogue Raisonné (London: Sotheby's Publications, 1984), p. 44, n. 6. Frye, Roland M. The Renaissane Hamlet. Issues and Responses in 1600. (Princeton: 1984), pp. 94-95. Pallucchini, Rodolfo. Veronese (Milan: Arnoldo Mondadori, 1984), p. 67, 170, no. 50. The J. Paul Getty Museum Handbook of the Collections. 1st ed. (Malibu: J. Paul Getty Museum, 1986), p. 90. Venema, Adriaan. Kunsthandel in Nederland, 1940-1945. (Amsterdam: 1986), pp. 269, 577. Fredericksen, Burton B. Masterpieces of Painting in the J. Paul Getty Museum. Rev. ed. (Malibu: J. Paul Getty Museum, 1988), unpaginated, no. 10, ill.
Rearick, William R., ed. The Art of Paolo Veronese 1528-1588, exh. cat. (Washington, D.C.: National Gallery of Art, 1988), 118-19, no. 61, ill.
Pedrocco, Filippo, and Terisio Pignatti. Veronese: Catalogo completo dei dipinti (Florence: Cantini, 1991), p. 151, no. 57. Journey into the Masterpieces, 8: Venetian Feast. (Japan: 1992), no. 5-22, ill.
Fredericksen, Burton B., et al. Masterpieces of Painting in the J. Paul Getty Museum. 3rd ed. (Malibu: J. Paul Getty Museum, 1995), unpaginated, no. 12, ill., entry by Burton B. Fredericksen. Humfrey, Peter. Painting in Renaissance Venice (New Haven and London: Yale University Press, 1995), p. 250, no. 182. Pedrocco, Filippo, and Terisio Pignatti. Veronese. Rev. ed. (Milan: Electa, 1995), vol. 1, pp. 228-29, no. 125, ill.
Jaffé, David. Summary Catalogue of European Paintings in the J. Paul Getty Museum (Los Angeles: J. Paul Getty Museum, 1997), p. 130, ill.
Fredericksen, Burton B., et al. Masterpieces of the J. Paul Getty Museum: Paintings (Los Angeles: J. Paul Getty Museum, 1997), pp. 34-35, no. 16, ill., entry by Burton B. Fredericksen. Constantini, Morena. Véronèse (Paris: Gallimard, 2003). Nitti, Patrizia, et al, eds. Veronese: Gods, Heroes and Allegories, exh cat. (Paris: Musee du Luxembourg, with Skira, 2004), pp. 126-7, no. 23, ill., entry by Filippo Pedrocco. Véronèse Profane (Paris: Musée de Luxembourg, 2004-2005), p. 2, p. 2. Garton, John. Grace and Grandeur: The Portraiture of Paolo Veronese (London: Harvey Miller, 2008), pp. 100-1, 149-51, 206, 208, no. 22; ill. p. 158, pl. 34. 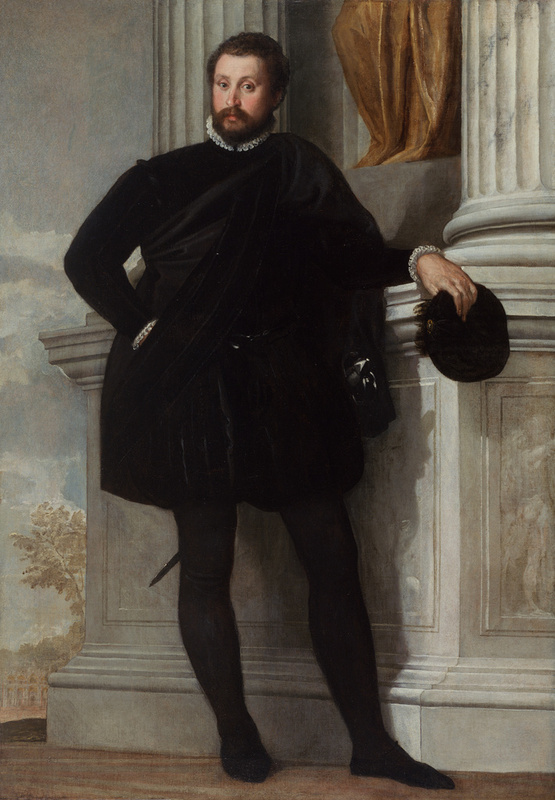 Salomon, Xavier F. Review of "John Garton, Grace and Grandeur: The Portraiture of Paolo Veronese." The Burlington Magazine 150, no. 1267 (October 2008), p. 694. Yeide, Nancy H. Beyond the Dreams of Avarice: The Hermann Goering Collection (Dallas: Laurel Publishing, 2009), p. 320, no. A671, ill. p. 105. Brilliant, Virginia. "Veronese in America: Collecting and Taste." In Paolo Veronese: A Master and His Workshop in Renaissance Venice, exh. cat. Virginia Brilliant and Frederick Ilchman, eds. (Sarasota: John and Mable Ringling Museum of Art, with Scala, 2012), p. 96. Garton, John. "The Portraiture of Veronese." In Paolo Veronese: A Master and His Workshop in Renaissance Venice, exh. cat. Virginia Brilliant and Frederick Ilchman, eds. (Sarasota: John and Mable Ringling Museum of Art, with Scala, 2012), pp. 120-133, pp. 123, 125, 126-27, 129, 265, no. 16, ill.
Maria, Blake de. "Veronese and His Patrons." In Paolo Veronese: A Master and His Workshop in Renaissance Venice, exh. cat. Virginia Brilliant and Frederick Ilchman, eds. (Sarasota: John and Mable Ringling Museum of Art, with Scala, 2012), p. 47. Rosand, David. Véronèse. Odile Mengaux and Renaud Temperini, trans. (Paris: Citadelles & Mazenod, 2012), pp. 272-73, fig. 228. Humfrey, Peter. Review of Paolo Veronese: A Master and his Workshop in Renaissance Venice. John and Mable Ringling Museum, Sarasota. The Burlington Magazine 155, no. 1320 (March 2013), p. 204. Zamperini, Alessandra. Paolo Veronese (Verona: Arsenale Editrice, 2013), pp. 286-87, ill.
Salomon, Xavier F., ed. Paolo Versonese 1528-1588, exh. cat. (London: National Gallery, 2014), pp. 89, 90, fig 60, 254, no. 17, ill.
Bayer, Andrea, Dorothy Mahon, and Silvia A. Centeno, "An Examination of Paolo Veronese's Alessandro Vittoria." Metropolitan Museum Journal 52 (2017), pp. 123, 125, ill.